Unprecedented neutrino discovery is a "Nobel Prize in the making"
By drilling a 1.5 mile hole deep into an Antarctic glacier, physicists working at the IceCube South Pole Observatory have captured 28 extraterrestrial neutrinos — those mysterious and extremely powerful subatomic particles that can pass straight through solid matter. Welcome to an entirely new age of astronomy. Back in April of this year, the same team of physicists captured the highest energy neutrinos ever detected. Dubbed Bert and Ernie, the elusive subatomic particles likely originated from beyond our solar system, and possibly even our galaxy. What are neutrinos, and how do they come from beyond our solar system? Neutrinos are extremely tiny and prolific subatomic particles that are born in nuclear reactions, including those that occur inside of stars. And because they're practically massless (together they contain only a tiny fraction of the mass of a single electron), they can pass through normal matter, which is why they're dubbed 'ghost particles.' Neutrinos are able to do this because they don't carry an electric charge, so they're immune to electromagnetic forces that influence charged particles like electrons and protons. But not all neutrinos are the same. The ones discovered by the IceCube team are about a billion times more energetic than the ones coming out of our sun. A pair of them had energies above an entire petaelectron volt. That's more than 1,000 times the energy produced by protons smashed at CERN's Large Hadron Collider. So whatever created them must have been extremely powerful. Like, mindboggingly powerful — probably the remnants of supernova explosions. Indeed, as a recent study has shown, these cosmic explosions are more powerful than we could have ever imagined — to the point where they're defying known physics. Other candidates for neutrino production include black holes, pulsars, galactic nuclei — or even the cataclysmic merger of two black holes. That's why the discovery of these 28 new neutrinos, and the construction of the IceCube facility, is so important. It's still a mystery, but these new findings, and the new detection technique, will help. Back in April, the IceCube project looked for neutrinos above one petaelectronvolt, which is how Bert and Ernie were detected. But the team went back and searched through their data and found 26 neutrinos with slightly lower energies, though still above 30 teraelectronvolts that were detected between May 2010 and May 2012. While it's possible that some of these less high-energy neutrinos could have been produced by cosmic rays in the Earth's atmosphere, the researchers say that most of them likely came from space. And in fact, the data was analyzed in such a way as to exclude neutrinos that didn't come from space and other types of particles that may have tripped off the detector. "This is a landmark discovery — possibly a Nobel Prize in the making," said Alexander Kusenko, a UCLA astroparticle physicist who was not involved in the IceCube collaboration. 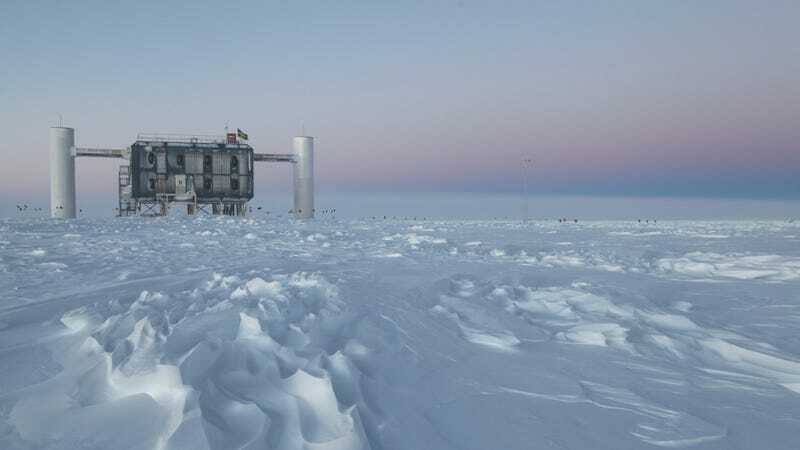 Thanks to the remarkable IceCube facility, where neutrinos are captured in holes drilled 1.5 miles down into the Antarctic glacier, astronomers have a completely new way to scope out the cosmos. It's both literally and figuratively changing the way we see the universe. "It really is the dawn of a new field," said Darren Grant, a University of Alberta physicist, and a member of the IceCube team. The next phase of the project will involve the creation of a skymap — a map of the cosmos showing the directions that the neutrinos came from. Read the entire study at Science: "Evidence for High-Energy Extraterrestrial Neutrinos at the IceCube Detector".